Summer and fall mark two of the most beautiful, warm, and welcoming seasons here in Estes Park. Hummingbirds flitter by while the wind rustles aspen leaves and water cascades over boulders in the Big Thompson River. It’s prime time for a stay here at Rams Horn Village Resort! Let’s talk about some of the best that Estes has to offer here in the warmest months of the year. From marmots to moose, you can catch a glimpse of some of the most majestic creatures that reside on these Rocky Mountain hillsides. Take a quick trip to Rocky Mountain National Park (only a minute away from the Resort), and you’re sure to see wildlife—that is, if you haven’t already seen some creatures on your way into town. Deer, elk, and bighorn sheep are common throughout the valley and the Park. You’ll also see smaller critters, including marmots as we mentioned, as well as pica, fox, a vast variety of birds, and of course, squirrels. If you’re lucky, you might also catch a glimpse of a black bear, a coyote, or even a mountain lion or a bobcat. Just be certain to stay safe and keep your distance! 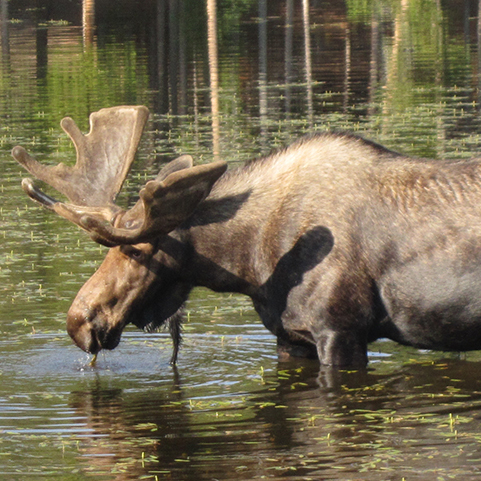 You can learn more about the wildlife you can expect to see on the Rocky Mountain National Park Wildlife and Parks page. From hiking to miniature golf, you’re sure to entertain the whole family here in Estes Park. Go geocaching with the kids. Get a couple of rounds of putt putt in at Fun City or Ride-A-Kart. Head to Gem Lake for a hike (there’s a beautiful surprise at the end of this 3.2 mile roundtrip hike!). Then cool down with a scoop of ice cream from any of the local shops, including Hayley’s Ice Cream, the Munchin’ House, and the Danish Cone Factory. There’s certainly no shortage of things to do, so be sure to book a long stay here at the Resort! If you’re looking for more things to do, take a look at the Estes Park Kids & Family Activities page. Downtown has more than just ice cream for the kiddos. If you’re in the mood to shop, downtown Estes Park has a slew of quaint stores and Mom and Pop shops. Find a new favorite shawl, or pick up a book at historic McDonald’s Bookstore to read while you’re out on your Rams Horn Village porch. And don’t forget to buy a few souvenirs for the fam while you’re in town! If you’re looking for a drink or great meal, try The Rock Inn Mountain Tavern (it’s a short walk away from the resort)—it features real Rocky Mountain food, several local brews, and that authentic, log-cabin feel. You can even catch a live band! There’s a wonderful variety of great restaurants within a short drive from Rams Horn Village. Or, if you’re downtown, check out one of the several award-winning Estes Park craft breweries, wineries, and distilleries. Estes Park is a true escape from your day-to-day responsibilities, and it’s the perfect place to unwind, and replenish your soul. In the mornings, enjoy your morning cup of coffee with unbeatable views of Longs Peak, Rocky Mountain National Park, and Estes Valley. Claim a hammock outside your Rams Horn Village cabin and catch a good snooze. Plus, Estes offers a full variety of spa and wellness centers. Or visit any of the many spas throughout downtown. Also, take some time to check out the galleries and museums that abound around town. Now, you can get a spa treatment anytime, so maybe you’d prefer to make the most of your stay by making the most of the outdoors while you’re here in Estes. If so, you can take a brief jaunt over to the Big Thompson River to catch some fish (or head to any of the local streams, ponds, lakes, and creeks). Not a fisherman? Well take a hike. 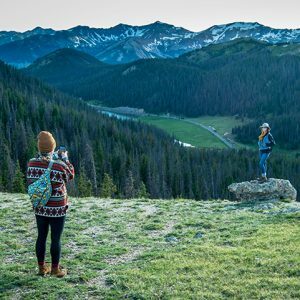 Rocky Mountain National Park is full of endless miles of trails, including easy hikes like Bear Lake and Bierstadt Lake (they’re just a walk in the Park! ), as well as difficult hikes like Longs Peak Trail (it takes bravery and strength to reach the summit of Colorado’s most difficult 14ers!). If you like to bike, there are plenty of biking trails, and if you prefer to see the Rockies via horseback, you can borrow a pony for the day at one of the many stables scattered throughout the valley. If you’re feeling bold, try your hand at whitewater rafting, just be sure to book your rafting excursion in advance! Trips fill up quick! Not an adrenaline junky? If you’re looking for a more casual way to enjoy the outdoors, get a round of golf in at the Estes Park Golf Course and Pro Shop (an 18-hole course) or the Lake Estes Executive 9-Hole Golf Course. There are so many ways to make the most of the warmest months here in Estes Park; we’re certain that you’ll find the best way. If you’re ready for an unforgettable experience here in Estes Park, schedule a stay here at Rams Horn Village Resort. 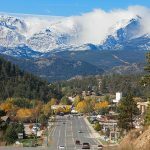 We’re located a few minutes from downtown Estes as well as Rocky Mountain National Park. Enjoy all the amenities of our real Rocky Mountain town, as well as the grandeur of Rocky Mountain National Park. All the while, enjoy your stay in one of our top-rated luxury cabins in the Rockies. Join us in Estes Park, and discover the friendly character of our resort, our town, and the glory of our mountains!